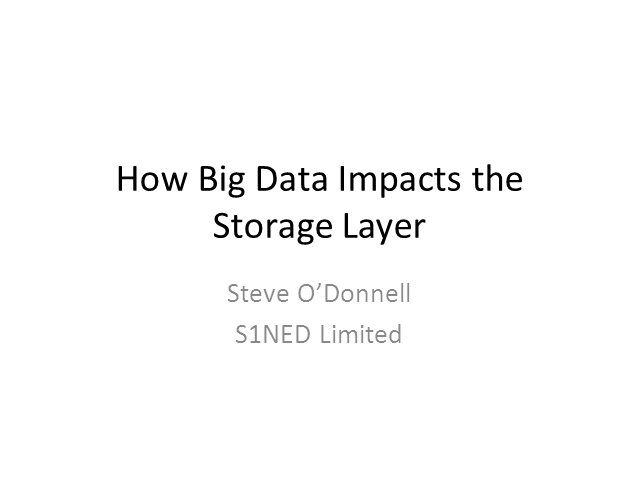 Steve will be addressing the storage implications of 'Big Data', in terms of the IOPS demands from conventional scale up solutions and relational data contrasted with unconventional scale out solutions using non relational data. I will look at the impact of row and column compression, low latency SANs, solid state disks as means of scaling up relational Big Data. I will also look at Hadoop DFS, NoSQL, Sharding, MapReduce, Cassandra and scale out storage and the requirements for IO. Steve will compare and contrast, Oracle ExaData, Acunu Storage Platform, and EMC Greenplum looking at how each takes a different approach to solving the 'Big Data' problem.